Reds eye starlet Martin Odegaard Norway starlet Martin Odegaard has been targeted by Liverpool as he was spotted with Philippe Coutinho. Norway starlet Martin Odegaard has been targeted by Liverpool as he was spotted with Philippe Coutinho recently. Stromsgodset midfielder Martin Odegaard was spotted while having a meal with the Liverpool attacking midfielder Philippe Coutinho. The 15-year-old who is the youngest player ever to play in the European Championship qualifier is likely a target of Liverpool boss Brendan Rodgers. . The Norway teenager has been in impressive form this term which has attracted many big teams including Premier League outfit Liverpool. Liverpool rivals Manchester United and Spanish giants Real Madrid are also reportedly in the race to sign the 15-year-old midfielder. Odegaard was at Melwood (Liverpool training ground) before being spotted with Coutinho by a supporter who tweeted the photo with them. 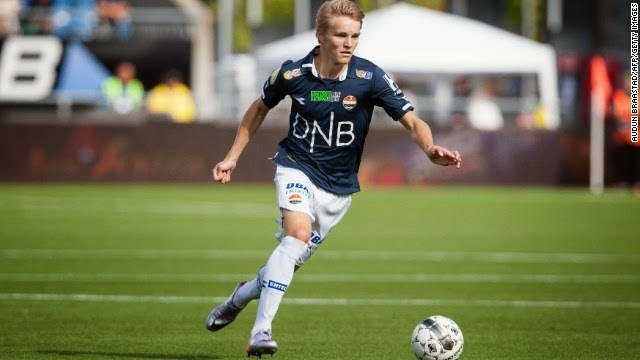 Odegaard told German media BILD last month that Liverpool might be his next destination. He added that Liverpool is that club for which players dream for. LFC is his dream and his next destination. He also added last month that it is about finding a team which is best for his future. He is still unsure about his future. But right now it seems that he has chosen his next destination which is Liverpool. He has scored 5 goals in 27 games for Strømsgodset in 2014 season.